Cuerpo de Bomberos de Manzanillo, D.R. MONTECRISTI, DOMINICAN REPUBLIC (Oct. 21, 2015): Trek Medics International, a New York-based nonprofit organization that develops 911 systems in resource-limited communities, today announced a grant from the U.S. Agency for International Development (USAID) to expand the implementation of their innovative emergency dispatching software, Beacon, in rural Dominican Republic (D.R.). Beacon is a text message-based emergency medical dispatching platform designed specifically for communities where advanced “911” technologies are too costly or inappropriate. “Beacon works by relaying requests for urgent assistance from the scene of an emergency to trained layperson responders in the community who can locate, stabilize and transport patients to the hospital wherever a mobile signal exists,” said Dr. Munjal. Trek Medics will use Stage 1 funding from USAID’s Development Innovation Venture (DIV) to scale their coverage from 15,000 to 175,000 residents within the next year, ensuring that all persons requesting emergency assistance in the catchment area will be attended to by trained community responders with access to transport within 10 minutes in village centers, and within 30 minutes in outlying and isolated communities. 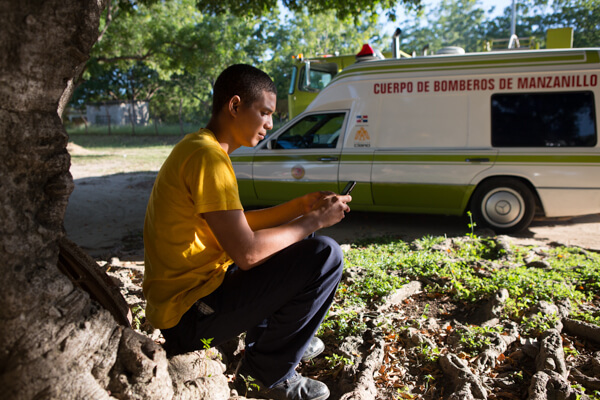 Trek Medics’ work in the D.R. started in June 2014 after receiving an email from a Peace Corps volunteer seeking a new ambulance for her community. Working with the local fire department and other community partners to train responders and implement Beacon, the program received additional support from Google and Cardinal Health in 2014, with the software’s launch in April 2015. Since then, community responders have transported nearly 100 patients for both emergency response and inter-facility patient transfers. Development Innovation Ventures (DIV) is an open innovation fund at USAID that sources, tests, and scales breakthrough solutions to global development challenges. Through a year-round grant competition for innovative ideas in any sector and nearly any country, DIV invests funding and hands-on support in solutions with the potential to deliver more impact, for lower cost, at sustainable scale. For more information about DIV, please visit http://www.usaid.gov/div.